Hello there, today we are celebrating the release of the Hero Arts December 2018 My Monthly Hero Kit. For me, I think they have saved the best kit till last! It is absolutely beautiful! It has a magical fairy theme and I think it will be perfect for lots of occasions. If you are following along in the hop, you should have arrived here from the amazing Jessica, but if you get lost along the way, I have the full list of participants below. I fell in love with this mouse as soon as I saw him. So cute! I thought he would look perfect sitting on top of the toadstool/mushroom. I first stamped the mouse, masked him off and then stamped the mushroom below. I also stamped the sentiment at the top. I then made a mask for the mushroom so that I could do some ink blending in the background. I masked off the edges of the panel with Post-It tape and then blended on Twisted Citron and Mowed Lawn Distress Inks at the bottom and Tumbled Glass and Broken China inks at the top. All of the masks were removed and then the images coloured with Copic Markers (the colours I used are listed below the supplies section). The panel was added to a white A2 card base with tape runner. COPIC MARKERS: Mouse - W5, W3, W2, W1, W0, R00. Mushroom - R89, R37, R29, R27, R24, E43, E42, E41, E40. Grass - G46, G43. The December 2018 My Monthly Hero Kit contains a 6" x 8" clear stamp set, 18 coordinating Frame Cuts, 8 5.5" x 8.5" sheets of shimmer cardstock (Misty Rose, Lime Gold, Breeze and History), Moonshine confetti mix and a Sakura Stardust Jelly Roll pen. All of this is worth $65 but you can get it for $34.99 (approximately £28 depending on exchange rate). The kits are limited edition and often sell out quickly. You can subscribe here so that you never miss a kit. 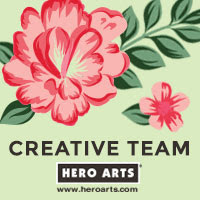 Hero Arts are giving away one kit to one lucky blog hop reader. The winner will be selected from all of the comments left across all of the stops in the hop. The giveaway closes Sunday, December 9th at 11.59pm. The winner will be announced on the Hero Arts blog the following week. Good luck! 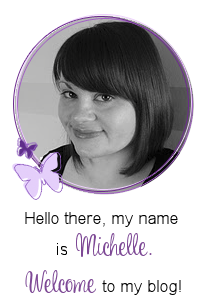 Next on the hop is the amazing Nichol. Thanks so much for stopping by today, I really do appreciate it. Hope you enjoy the rest of the hop! Love that you placed the mouse on the mushroom! Your design is very clean, which I admire. This is great HA December Release! What a pretty card and I love all the white space. I struggle with that in my card making. Beautiful cards and such an awesome kit! Beautifully done kit and your design is awesome ! The mouse , so cute ! Super cute card Michelle. Beautiful coloring against the pretty background and love the white border. Gorgeous card! That mouse is just your style. Love it. Adorable! I love the ink blended background! I like how you transitioned the grass to sky. The mouse is adorable, too!!! What a sweet card! I absolutely love the precious mouse on the mushroom. Great composition! That mouse is really sooo adorable! Awesome ink blending too! love the sweet simplicity of your design! That mouse image is so sweet on your card! Love your adorable card and thank you so much for posting your Copic colors. I don't always want to match but sometimes a nudge in the right direction on color choice really helps! Your card is so cute! Thank you for sharing your techniques with us! Your card is so cute! The light, delicate background is perfect for the little mouse. Thank you for sharing and your creativity. I love your blended background. 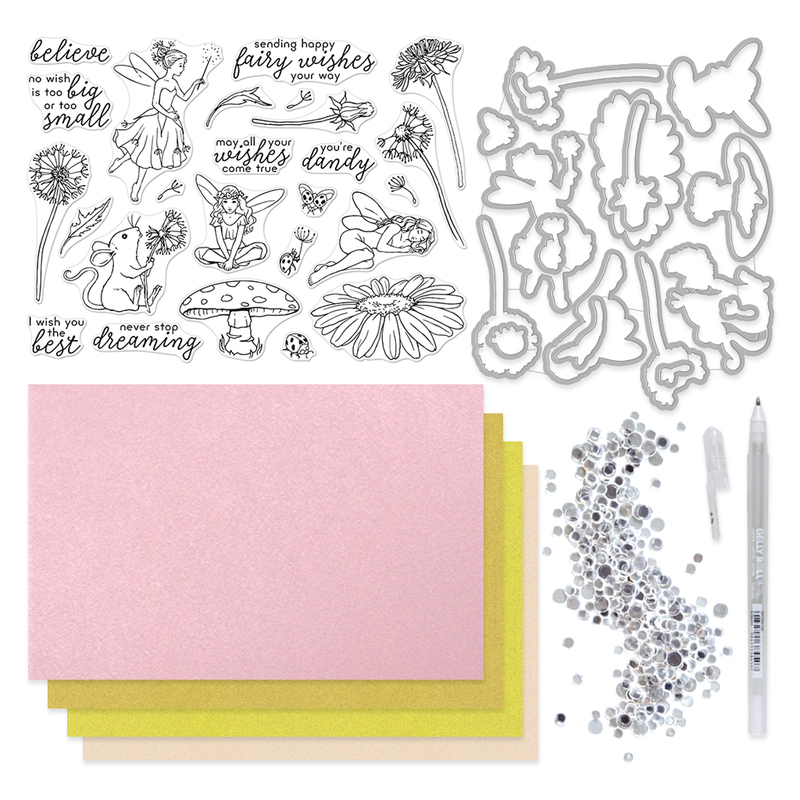 I would love to have these adorable fairies as I don’t have one fairy stamp and Hero Arts kits are sooo beautiful as always... and they still offer red rubber stamps and are a green company. Thank you again! What a darling little mouse on a mushroom...so cute!! Love the image, love the background, love the coloring. Just an adorable little mouse! I love this clean and simple design. Really beautiful!! This kit is so versatile, I just love it!! Very nice ink blending. I like the white frame you created by masking off the sides. This is SO darling! I love that pretty background too! Such an adorable card! :) That little mouse is so cute, and you did a great job coloring. What a great coloring job. I love your card. TFS! Love this elegant CAS design, so cute! 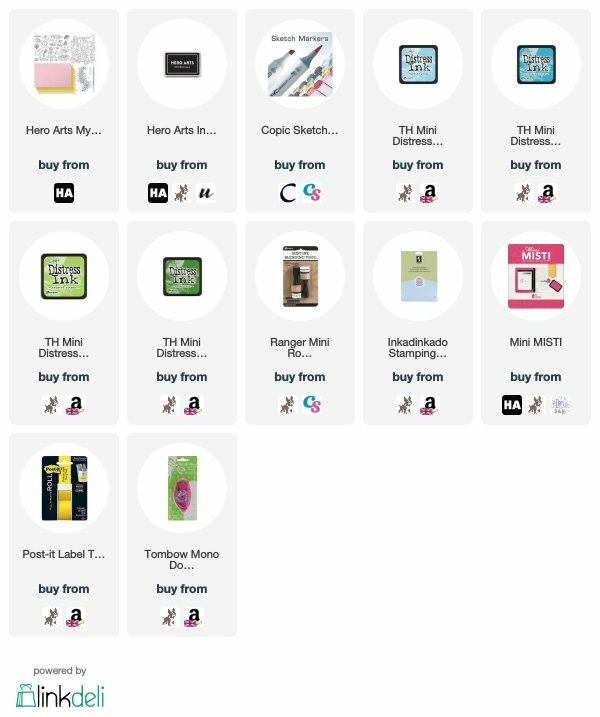 Everything is so lovely, this card, your designs, and Hero Arts My Monthly Hero card kits! Adorable card! I love your coloring! He's a sweet little mouse. That little mouse sitting atop the mushroom is just adorable. Beautifully colored. Lovin' the kit more and more. Very sweet card. I love your background. Your mouse is perfectly colored and your mushroom is so bright. I really like the delicate nature of your background! So cute and sweet, love the kit. 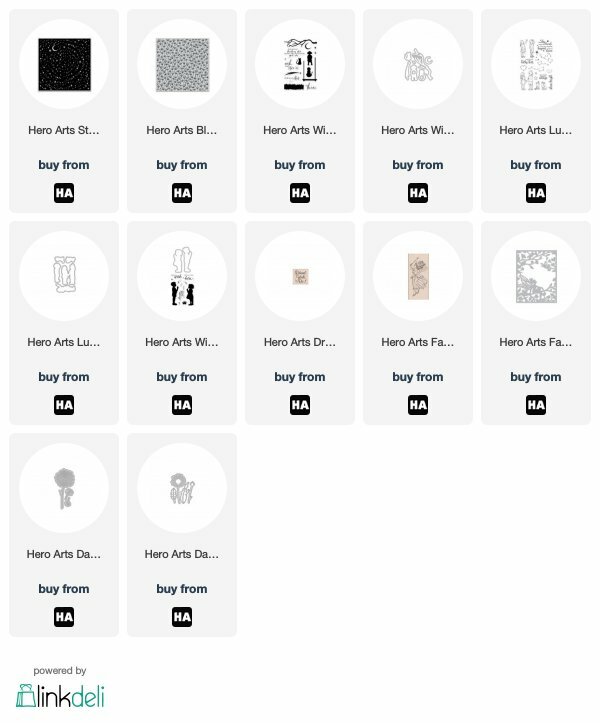 Thanks for sharing you designs. Such a sweet card. The mouse is so adorable. I love that little mouse too, he is so sweet. Your card is very pretty! Love the colors you picked for it. This is too cute! That mouse is adorable and looks great on the mushroom. Love the sweet little mouse making a wish! Thanks for sharing! That is such a sweet image - I love your soft colours. 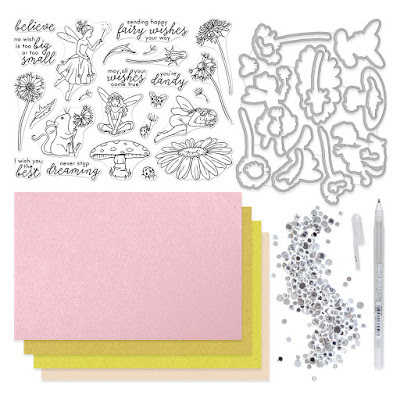 What a cute card and fun kit! Great coloring, thanks for sharing. Such a cute mouse card, great kit! 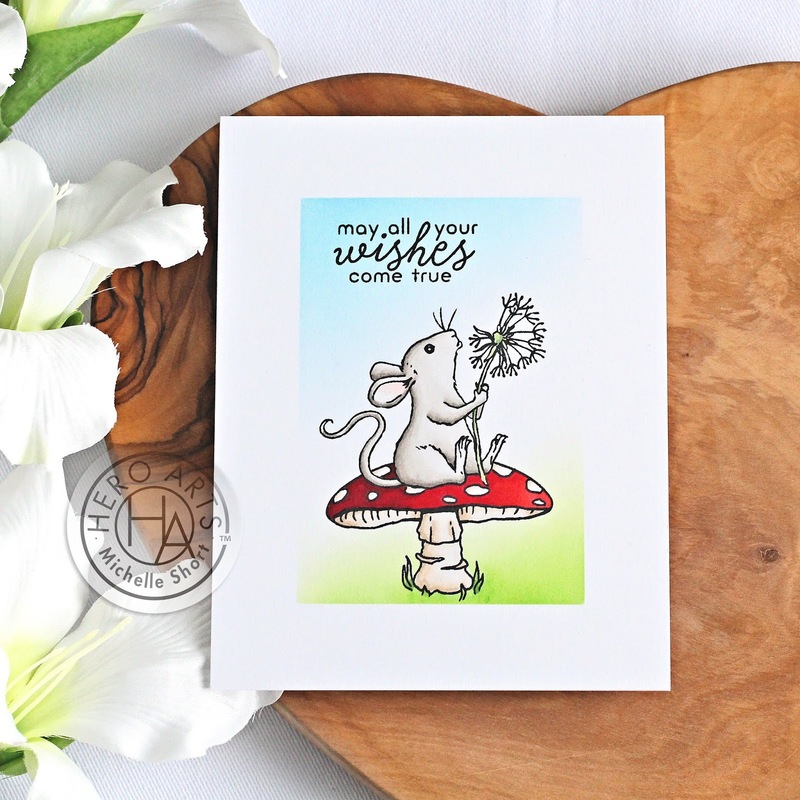 Michelle, I am in love with your sweet scene and how gorgeous the vividness of the mouse and mushroom pop with that soft blended background. How cute!! Love how you masked it to make this sweet little scene. Thank you for sharing your beautiful work! Adorable card - love the elements in this release! I think everyone has fallen in love with that mouse! Who wouldn't fall for a cute little mouse blowing wishes! She looks so perfect sitting on that mushroom. The background is really lovely, just simple so that it doesn't take away from the main character of your card. Thank you so much for sharing your amazing creativity!